This distinctive Handbook covers the breadth of sports and media scholarship, one of the up-and-coming topics bridging media entertainment, sports management, and popular culture. Organized into historical, institutional, spectator, and critical studies perspectives, this volume brings together the work of many researchers into one quintessential volume, defining the full scope of the subject area. 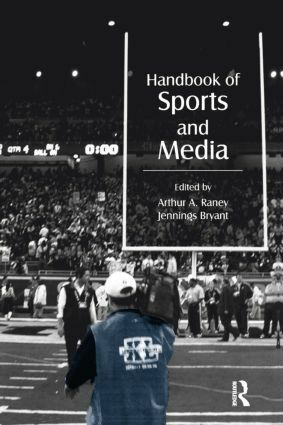 Editors Arthur Raney and Jennings Bryant have recruited contributors from around the world to identify and synthesize the research representing numerous facets of the sports-media relationship. As a unique collection on a very timely topic, the volume offers chapters examining the development of sports media; production, coverage, and economics of sports media; sports media audiences; sports promotion; and race and gender issues in sports and media. Unique in its orientation and breadth, the Handbook of Sports and Media is destined to play a major role in the future development of this fast-growing area of study. It is a must-have work for scholars, researchers, and graduate students working in media entertainment, media psychology, mass media/mass communication, sports marketing and management, popular communication, popular culture, and cultural studies.